‘Your essential guide to the ‘Best Things To Do In Adelaide’ from fabulous festivals and winery-crawling; to great food and much more! This ultimate guide will have you eating, drinking and seeing the best Adelaide attractions in a short time. Adelaide airport is only minutes away from the city centre. Adelaide’s public transport system Adelaide Metro runs varies forms of transport to and from Adelaide domestic and international airports. Trains, buses, and trams operate throughout the greater metropolitan area (Adelaide Metro) and regional bus services (Connect SA). Visitors can take advantage of the Adelaide Metro App and Metro Card. Other transport options include Ride Share Uber and Lyft and Adelaide Independent Taxis. Why Adelaide? | It’s A City For Everyone! Adelaide is loved for all different reasons. Visitors flock here for its booming food and festival scene plus thriving arts facilities. The region is well-renowned for its Australian premier wines, showcased from South Australia’s best architecturally-designed cellar doors. Looking for things to do in Adelaide this weekend? Well, there is an insane amount of fabulous experiences on offer in the City of Adelaide; all within a short drive of the CBD. Glorious sandy beaches, picturesque wineries, gourmet food made from locally grown produce and nature walks with breathtaking city views. 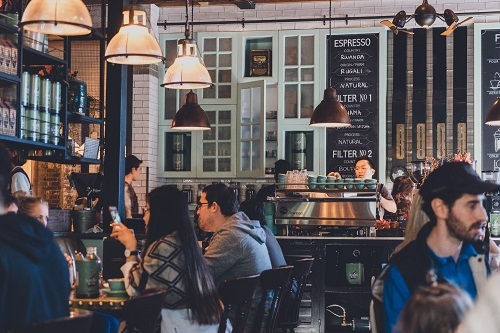 Within the CBD, you’ll discover world-class galleries and art museums, fine dining restaurants, quirky cafes, food trucks, buzzing bars and hipster music joints. My go-to-travel-site to find ‘What’s on in Adelaide‘ is the official South Australia government tourism site. It’s loaded with useful information on each region. 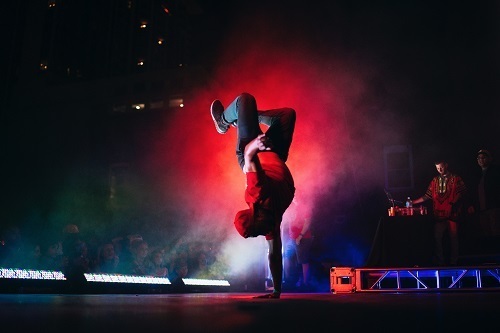 If you are looking for entertainment ideas on specific dates then you can find ‘What’s on in Adelaide today’ on this website. Salvador Dali art lovers don’t miss a visit to d’Arenberg estate. From 5 March, 23 of Salvador Dali graphic artworks and bronze sculptures are on display in the d’Arenberg cube for a limited time. The exhibition makes the 30th anniversary of the famous artist’s passing in 1989. Tickets start from $20pp for the 90 minute exhibition. Also featured in the exhibition is works by Australian Contemporary Surrealist Artist, Charles Billich. His artworks continue to captivate the imagination of art lovers and collectors around the world. Keep up to date with all the d’Arenberg new, events and experiences here. 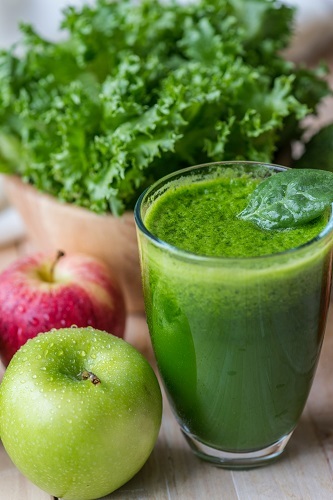 Health Conscious Travellers | We’ve Got You Covered! In 2018, Adelaide was named as one of the world’s top healthiest cities. 89 cities were judged on 10 criteria including work-life balance, air and water quality, annual sunshine hours, life expectancy and annual holidays. Adelaide ranked No 8 with an overall score of 6.31. Booking.com and TripAdvisor Adelaide offers a selection of city hotels to suit every budget. 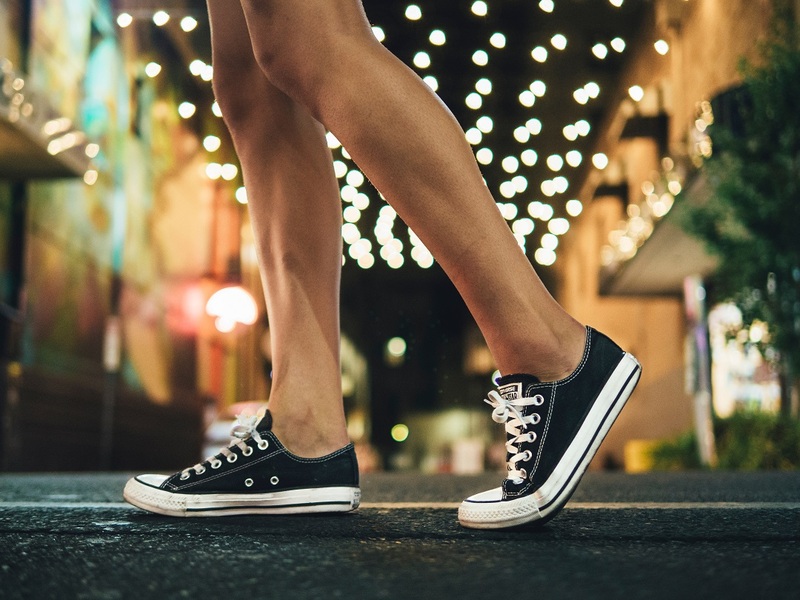 Some best things to do in Adelaide for free are to utilise the several fitness trails, running loops for walkers, cyclists and runners scattered throughout the city’s parklands. Today’s travellers have become more health conscious. 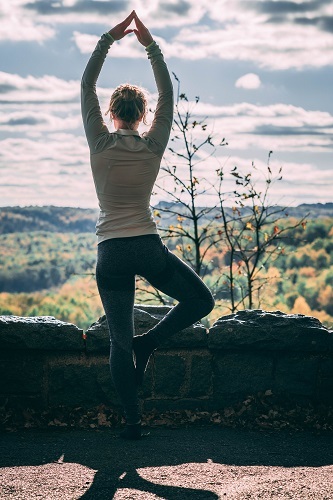 Forward thinking hotels are meeting these needs by offering wellness holiday packages ranging from fitness, mediation and holistic health retreats. Kangaroo Island Health Retreat ‘Dynamic Detox’ program is ideal for busy people who want exceptional results in minimal time. Kangaroo Island paradise is located 16 km off the Fleurieu Peninsula and only minutes from the mainland by Sealink Ferry or air. Planning a holiday around a festival is a great idea. 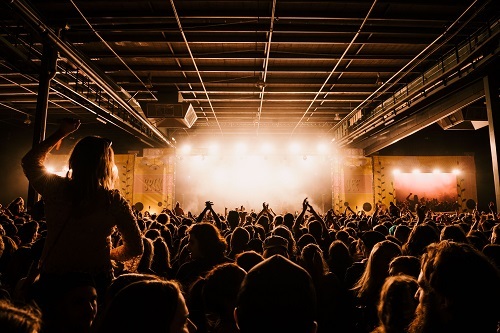 But, before booking flights and accommodation to Adelaide it is wise to confirm festival dates and ticket availability on the official festival websites. South Australia is well-known by Australians as the ‘Festival State.’ The most famous festival is the ‘Adelaide Fringe‘, but there are other great festivals scattered throughout the calendar. 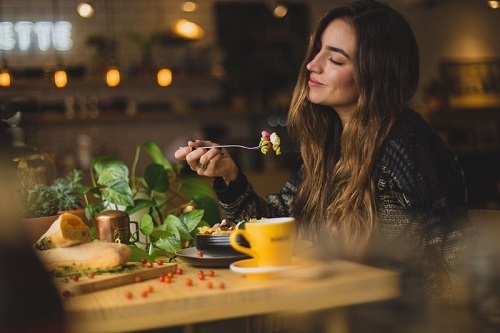 Winter and Spring weekend events like McLaren Vale ‘Sea and Wines‘ in June and Barossa Gourmet in September attract National and international visitors to South Australia. These 3-day festivals showcase South Australia’s premier world-class wines and authentic local foods created by passionate chefs. The city also hosts several free food and wine events throughout the year on Ebenezer, Leigh and Peel Streets. Adelaide Fringe Festival began nearly 60 years ago. Today, it is the largest arts festival in the Southern Hemisphere. For 4 weeks in February and March, artists from around the globe share their artistic talents and creativity in theatre, dance, film, comedy, cabaret, visual art and more. Enthusiasts of art, film and music can find hundreds of festival events, large and small, scattered throughout the region. Pop-up and permanent spaces are transformed into ‘Fringe’ venues from pubs and laneways to tents and abandoned buildings. Around the world thousands of people come together for Pride Marches. The first Pride March Adelaide happened in 1973, when homosexuality was still illegal. Today, Adelaide Pride March celebrates the resilience, courage, solidarity and love within the gay community. Forty plus years on, Pride March has become one of the biggest and most loved November event in Adelaide’s community. Pride Walk, a rainbow of colours, was installed by ‘The City of Adelaide’ at Light Square opposite Adelaide College of the Arts in 2016. The colourful stencilled timeline path gives an insight into the legal and policy reform in South Australia. The colours represent, celebrate and acknowledge diversity, achievements and difficulties faced by Lesbian, Gay, Bisexual, Transgender, Intersex and Queer (LGBTIQ) community and towards a journey of acceptance. 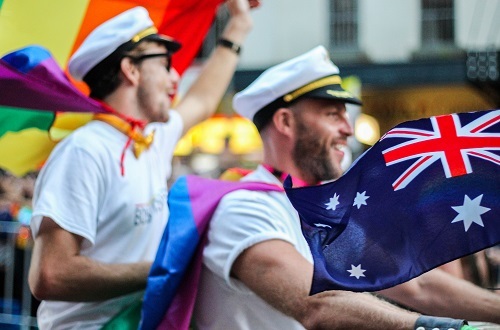 In 1975, South Australia was the first state to decriminalise male homosexuality and it took the last remaining state, Tasmania, 22 years to follow suit. Garden of Unearthly Delights is a unique festival playground that attracts over 800,000 visitors annually to Adelaide parklands. Adelaide’s Rundle Park is a special place to be during its ‘Mad March’ city’s summer arts festival season. 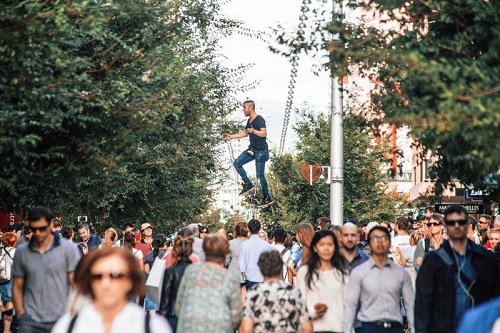 The park is decked out with numerous performance venues, carnival activities, funky bars, multicultural food and market stalls. Its exceptional arts and entertainment program is unique, vibrant with electrifying energy for all ages. Inner city parks and nearby beaches are both enticing and inviting; facilities are well utilised and offer visitors a sense of well-being, community mindedness and cultural togetherness. 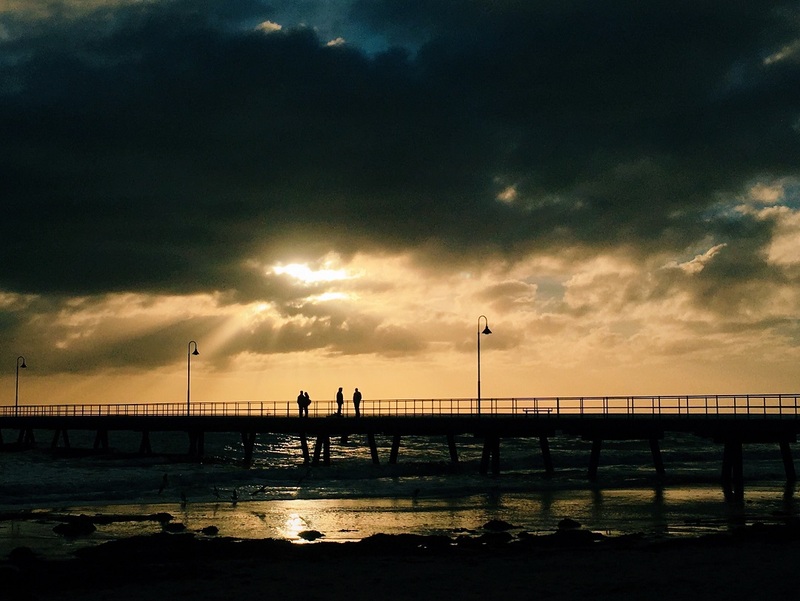 Glenelg is the most famous Adelaide beach, well-known for stunning sunsets, wide beach front, charming cafe scene, laid-back pubs, boutique shopping and buzzing vibe. The Bay Discovery Centre and Information Centre is located in Glenelg’s iconic 1870s Town Hall in Moseley Square. The local history and arts museum celebrates the cultural heritage of South Australia. A permanent exhibition of vintage swimwear is on display on the Mezzanine Floor. The 1930s to 1960s collection was donated by Fashion Collector Violet Rowe. The exhibit shows the evolution of swimwear during that period by iconic Fashion designers who rose to fame around the globe. Entry is Free. When you tire a little of city life, it’s time to head to the hills – ‘The Adelaide Hills’. Charming hillside villages like ‘Hahndorf’ are very beautiful with tree-lined streets and cafes, bakeries, pubs, cottages, galleries, boutiques and handmade Australian preserves, fudge and ice cream shops. Hahndorf is also proud of it German heritage, from the restaurants along Main Street promoting bratwurst and strudel to the shops with Germanic names. Where are the Best Places to Stay in Adelaide Hills? Depending on the experience you are looking for, Adelaide Hills accommodation is only limited by your budget. Whether you choose to stay at a luxury resort, an Adelaide retreat or historic B&B, Adelaide Hill’s day spa offer a range of relaxing massages, rejuvenating facials and revitalizing holistic therapies. Mount Lofty House is set in Adelaide Hills wine region and just 1.8 km from the Mount Lofty Summit. This 1852 designer boutique hotel is Adelaide’s most unique destination spa, incorporating quality products with the latest spa techniques. The Adelaide Hills hotel is famous for its luxury escapes, 3-hat fine dining restaurant, decadent and indulgent day spa experiences and mind-blowing weddings. Nearby, more than 300,000 visitors trek to the Mt Lofty summit each year to capture the breathtaking panoramic views across Adelaide’s skyline and coast. Also, close by is the Mount Lofty Botanic Gardens on 97 sprawling hectares. You can immerse yourself in the beautiful flora and aromas, take a stroll or partake in one of the more vigorous treks. Sticky Rice Cooking School and Stick Rice Villas offer award-winning Adelaide Hills accommodation. There are 3 luxury Asian themed B&B Villas – Japan, Bali and Thailand. Claire Fuller, owner, created each of these architecturally-designed luxury villas inspired from luxury holiday accommodation offered in these destinations. Fuller’s Sticky Rice Cooking School and award-winning Villas are located at picturesque Stirling in Adelaide Hills. 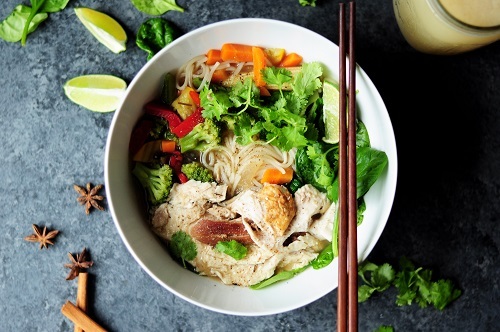 Whether you’re a competent cook or simply want a basic understanding of Asian cooking and ingredients, a hands-on Sticky Rice Cooking lesson is a great way to learn new skills, meet top Asian chefs and makes for a perfect day out with friends. Adelaide Hills offers the most delectable and diverse range of fresh regional produce. Two worker’s cottages on The Bridgewater Mill National Trust Site have been converted and beautifully restored into cosy accommodation. Each is tastefully furnished and decorated. The cottages are within walking distance is the Bridgewater Mill restaurant which is considered one of South Australia’s finest. The large watermill also known as the ‘old rumbler’ was manufactured in Scotland and assembled in Australia. The historic flour mill was built in 1860 by a mill engineer John Dunn from Devonshire. Today, the mill is an important Adelaide Hills attraction and one of the most photographed landmark in the region. Adelaide Hills is one of the 5 Top wine growing regions in South Australia and home to some of the world’s best winemakers. Some 60 wineries spread across the hills as well, Adelaide Hills produces cheese, chocolate, craft beer, cider and gin. Sip your way and South Australia, home to the most famous wineries in Australia. 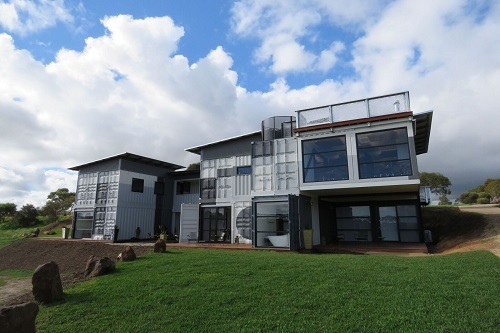 Petaluma Wines was awarded “The Real Review Certificate of Excellence‘ in 2018 for consistently producing excellent wines. The abundance of fresh local produce is the foundation of the Adelaide Hills winery and restaurant menus. Check out these other Adelaide Hills wineries – The Lane Vineyard, Penfolds Magill Estate, Wines by Geoff Harvey, and Bird in Hand. For more Adelaide Hills information, drop into the Visitors Information Centre in Hahndorf Village and check out Adelaide Hills Wine website. Like Adelaide Hills you are spoilt for choice by the McLaren Vale best wineries and vineyard tours. There is so many things to do; great McLaren Vale events, exquiste places to dine and luxury-spas to unwind in. This short itinerary will help to take some of the guess work out. 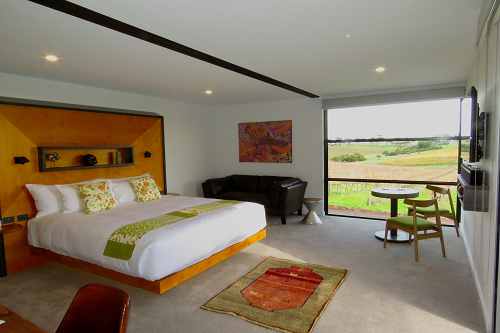 Firstly, you can’t go pass Inkwell Wines new luxury micro-hotel and suites in McLaren Vale. The little beauty is set in the well-established Inkwell Vineyard. It is the perfect luxury couple escape. The luxurious Hotel California Rd boasts ‘quality over quantity‘. The purposeful design has not compromised on comfort, style, ambience or luxury. 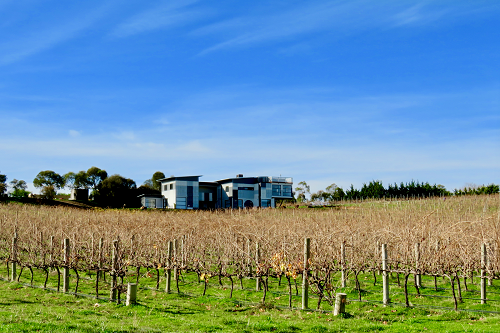 California Road is truly one of the best McLaren Vale accommodation options in the region. For more McLaren Vale Stays click here. In November 2017, d’Arenberg Wines chief wine maker and grape grower, Chester Osborn opened the new $15M modernistic Rubik’s style cube at d’Arenberg estate. The 5-story multi-purpose structure is complete with restaurant, bars, private dining, tasting rooms, office space and a large collection of eclectic art. Visitors can download an app to learn more about the 60 artworks on display in the Alternate Realities Museum located on the ground level. Regular events, balls and Masterclasses are held in The Cube. For more information check out the d’Arenberg website. 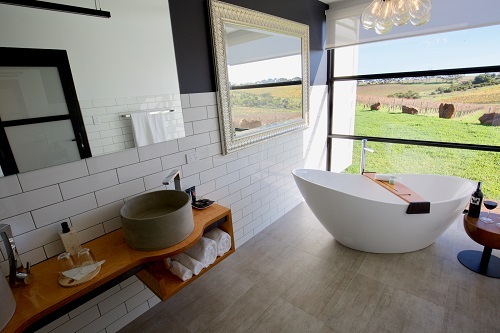 On level 1 are the funkiest bathrooms you’ll ever see – hidden behind a wall of artificial plants lies a number of corrugated iron cubicles, artistic designed urinals and quirky wall art with stunning views over McLaren Vale from large glass windows. The men’s toilets are more colourful and arty than the women’s with their large pods as urinals. The extraordinary McLaren Vale Cube masterpiece gives visitors the illusion of floating in the centre of a vineyard. It is easy to see why D’Arenberg won the 2019 international Best of Wine Tourism Award for Architecture and Landscape, recognised for its bespoke structure and design. The top floor cellar door overlooks the expansive vineyard with glorious 360 degree views of the rolling hills of Willunga and sea. The landmark building has become a major tourist attraction and put McLaren Vale further on the map internationally, generating more sales not just for d’Arenberg winery, but also the McLaren Vale region as a whole. A McLaren Vale winery experience wouldn’t be complete without a visit to the stunning Coriole Vineyards. The first vines were planted on site in 1873. 1972 saw the cellar door open in the original old ironstone barn built in 1860. This picturesque spot has wonderful views across the McLaren Vale vineyards, Willunga Range and Fleurieu Bight. Great things are happening at Coriole Vineyards. 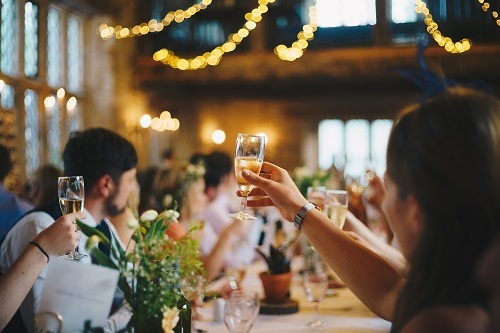 The vineyard won the South Australia 2019 Best of Wine Tourism Award for Arts and Culture. Gather at Coriele is a new destination dining experience in partnership with former Gather Food and Wine, head chef Tom Tilbury. Chef Tom is creating an evolving menu driven by seasonal and sustainable produce. A 6-course beverage matched dinner using locally sourced, ethically harvested and sustainable products from the region’s producers. For more Festival, Class Art Events and Wine Dinners head to the Coriole website. Apart from Coriole’s well-known wines, there are always opportunities to taste wines exclusively available at the cellar door. Coriole food products: locally made Woodside Cheeses, Extra Virgin Oil and Kalamata table olives are exceptional too. McLaren Vale doesn’t just produce quality wines. At McLaren Vale Distillery, Founder John Rochfort, former Tasmanian Lark Distillery CEO with Jock Harvey, his business partner and owner of McLaren Vale Chalk Hill Wines has slipped into whisky-making shoes. Whisky is commonly aged in wood from the wine industry. Retired wine barrels have been sourced from the region’s wineries. These retired-old barrels are where McLaren Vale Distillery will age its single malt whiskies. Each release will develop its own ‘local” characteristics and flavours over time. Agapanthuses are abundant in Adelaide in the summer months. Long lines of thick green strappy foliage with tall blue, mauve or white heads grace gardens across Adelaide suburbs, public gardens and vineyards. After trawling the internet for the history of agapanthuses in Australia, I stumbled across the 60 acre Adelaide Hills “Littlewood’ Agapanthus Farm and Nursery, 25 minutes’ drive from Adelaide city. From the moment you drive through the gates, there is a sense of peace and calm. It’s here you can see the beauty created from mass-planting over 100,000 agapanthus plants. A farm tour is a great way to learn about the wonderful agapanthus plant. Littlewood Agapanthus Farm is an absolutely stunning property for wedding photography and special events. Beautiful large trees, rolling hills, a charming lake and large Pavilion are surrounded by gardens bursting with mauve and white flowers; invoking a romantic feel to photographs. The 60 acre property and nursery is home to numerous species of agapanthus plants. The first gardens were established by the Gray Family back in 1997, who obviously put a lot of time, energy and money into how the farm looks today. Also, worth visiting is the small village of Uraidla, the newest hotspot in the hills. 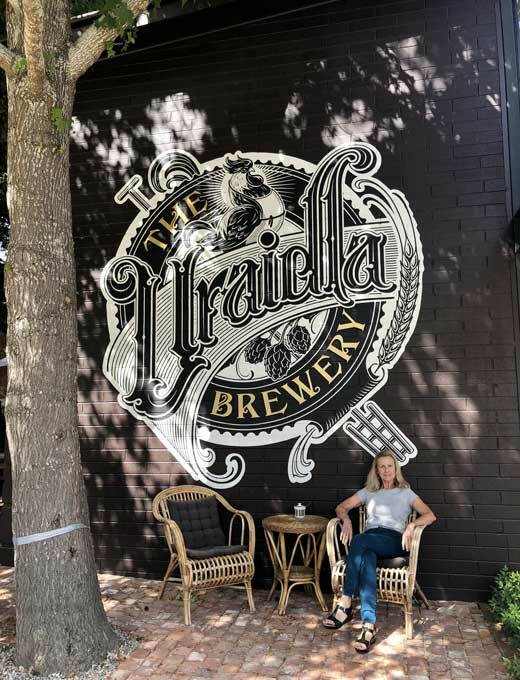 Home to ‘Lost in the Forest’ Wine Bar and restaurant; historic ‘Uraidla Hotel and Uraidla Brewery‘ and neighbouring ‘Republic Café Bakery’ featuring quirky upcycled materials, retro and antique furniture. The truth is there is no where in the world quite like ‘Adelaide’. Although, there are many places offering similar experiences ‘Adelaide’ is a destination that ticks all the boxes well. Looking For More Australia Holiday Destinations? For other travel stories like these and vacation tips, subscribe to Progressive Traveller and receive new stories directly in your inbox. Disclosure: This post contains affiliate links and I may have been compensated for my time writing this article.